The Zebra LS4208 from Zebra was designed for the most demanding applications in retail and light logistics. It features a special scanning technique that provides excellent performance usually unseen with laser scanners. This makes it especially useful for time-critical applications that require high throughput and accurate data collection. 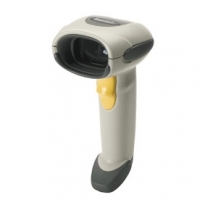 Its upgrade and programming functions ensure that the device is compatible with future bar codes and interfaces - for you this scanner is a particularly future-proof investment. Fast data collection at 200 scans/sec. Unlike conventional laser scanners, the LS4208 features a multi-line scan raster after every movement of the mirror, the horizontal alignment of the laser beam is adjusted slightly so that the scanner also reads the scanning area vertically. Using this special scanning technique, the LS4208 is able to read bar codes that are not recognised by conventional scanners, e.g. torn or heavily stained bar codes. Optionally there is a PDF-version available in addition to all commercial one-dimensional bar codes, this scanner also reads PDF417 and composite RSS codes like GS1 DataBar. The result is an extremely fast and continuous scanning process that speeds up every checkout and increases the number of content customers while reducing personnel expenses. A pleasant design and an integrated bar code trigger make the LS4208 very ergonomic. Additional convenience is gained with the optional Intellistand for freehanded scanning. When the scanner is inserted into this stand, it switches automatically into auto-scan mode so that all bar codes within range of the scanner are scanned automatically. Users do not have to activate scans manually in this mode. Also very convenient is the wide range of up to 78 cm depending on bar code type and size. The scanner does not have to be moved in front of the bar code anymore - simply aim at the bar code and pull the trigger. This scanner is equipped with a multi-interface that supports USB, RS232, keyboard wedge, as well as additional interfaces for POS and EDP systems. The scanner is available in light grey or anthracite.